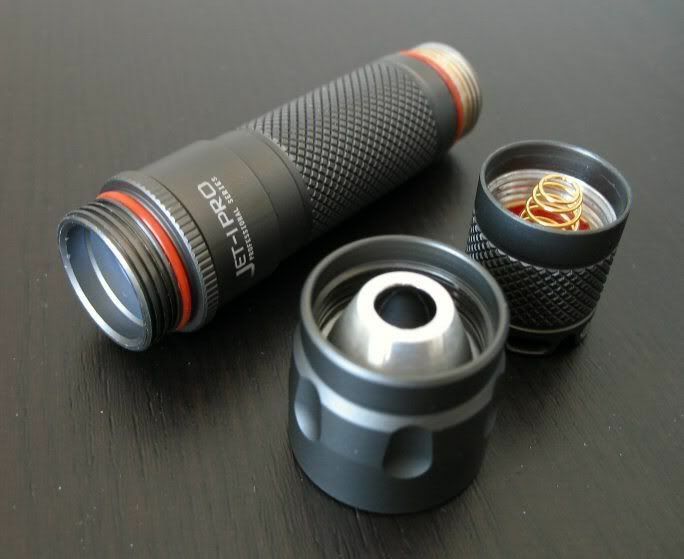 JetBeam JET-I PRO (Cree R2) 1AA Review: Beamshots, Runtimes, and more! REVIEWER’S NOTE: This is a two-part review – the first part is a build and runtime overview of the JetBeam Jet-I PRO, followed by detailed beamshot and runtime comparison to other lights. For a runtime comparison to all current 1AA lights in my collection, please see my Multi-stage 1AA review thread. 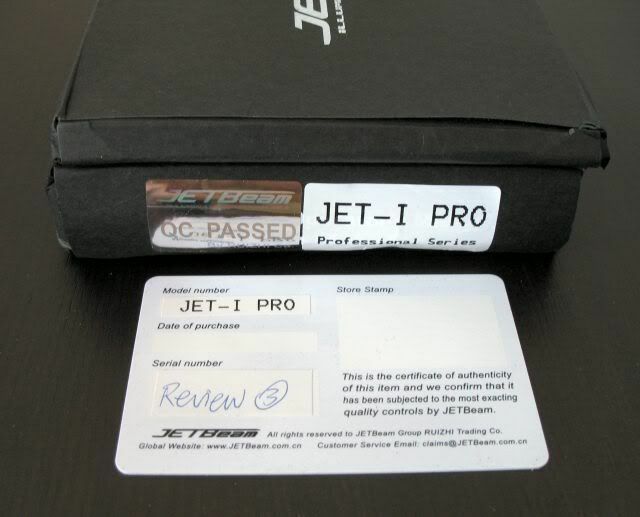 The Jet-I PRO was provided free of charge by JetBeam for review. UPDATE Aug 11, 2008:This light is no longer available, and has been replaced by a new IBS version of the 1AA Jet-I PRO. It is reviewed alongside its 2AA sibling in my review here. My review sample came in a thin cardboard box with JetBeam logos, and some light foam insulation inside (frankly, I’m surprised the box survived transport as well as it did, as it came packaged inside a regular bubble envelope). Inside, you’ll see it comes with warranty card, manual, wrist lanyard, and spare parts (o-rings, tailcap cover) – and of course, the light. Quality of the lanyard seems pretty good. You’ll note my sample is identified as “Review 3”. As you can see, exterior styling is very nice. 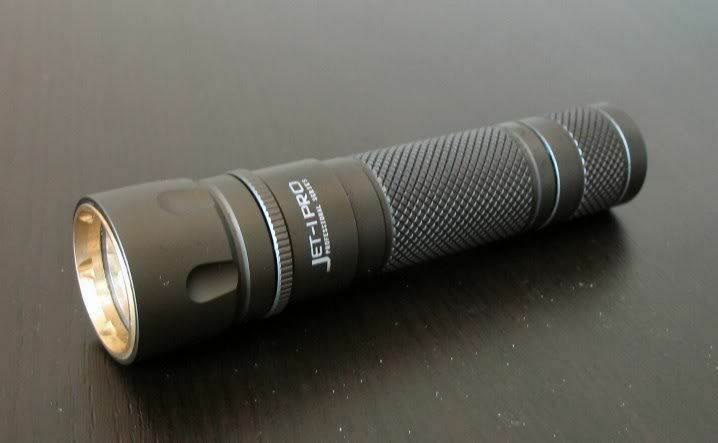 Light comes in a dark grey HA (type III) finish, similar to the JB C-LE. The metal clip is detachable (with some force). 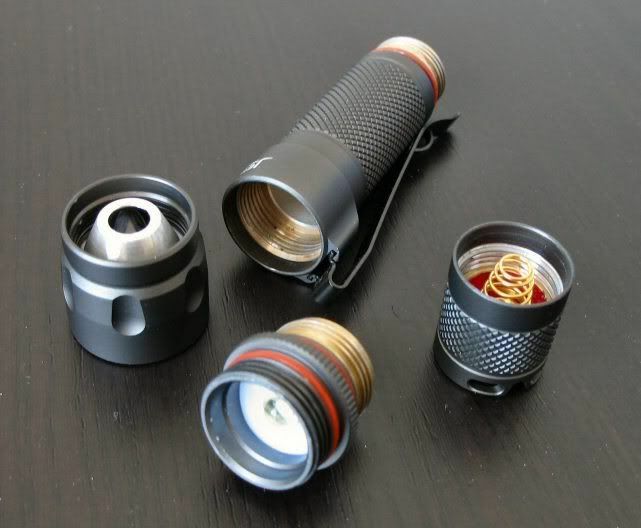 Knurling is not overly aggressive, but it is slightly more raised than most Chinese-made lights. As you can see from the business end shot, the Jet-I PRO uses the “silver” version of the new Cree R2 emitter (i.e. the area outside central die is silver in colour, instead of the standard Cree yellow). My understanding is that there are no output differences between the silver and yellow versions, and these simply reflect different manufacturing plants. However, there may be some tint issues (see my Build Quality section further down for a discussion). The light engine can easily be unscrewed from both the body and the head/reflector, opening up the possibility of easy upgrades (should JB provide upgrade modules). Like my JB MkIIX, there is a spring at the base of the light engine (i.e. at the positive battery terminal) so 14500s should not be a problem. Tailcap and switch are similar to MkIIX and C-LE v2. Note the presence of square screw threads, a favourite with machinists (and rare on flashlights). Note the brassy/gold-coloured coating on the inside battery tube and contact threads (apparently for some sort of anti-oxidizing effect, similar to the EDGETAC NiteCore DI). Testing Method: All my output numbers are relative for my home-made light box setup, a la Quickbeam's FR.com method. My relative overall output numbers are typically similar to his, although generally a little lower. You can directly compare all my review graphs - i.e. an output value of "10" in one graph is the same as "10" in another. Throw values are the square-root of lux measurements taken at 1m using a light meter. Yes, you are reading the graph above correctly - Med mode has both lower output and lower runtime than Hi on 14500. JetBeam is aware of the issue, and plans to fix the circuit for the next batch of lights produced. Although I didn't show it in the table, 2650mAh NiMH and alkaline have very similar initial output and throw as the Sanyo Eneloops. I’ve very impressed with the maximum throw of this 1AA light, on all battery types. Surprisingly good, given the size of the reflector. Maximum output on alkalkine and NiMH (both high-capacity and low self-discharge) is excellent, comparable to the EDGETAC NiteCore DI (which was first 1AA light to really push the envelope for output on AA). Also like the NiteCore DI, output on 14500 on Hi is good - but not that much brighter than NiMH. This is also deliberate on JetBeam’s part, in order to maintain good regulation and thermal management. But this means that some of the older lights that run direct-drive on 14500 (like the Fenix L1D and JetBeam’s original MkIIX) will be brighter initially on 14500 (but with lower runtimes, of course). Efficiency of the Med/Lo modes is not very good on the Jet-I PRO. In fact, there is some problem with 14500: you get less output and less runtime on Med. EDIT: JetBeam has informed me that they plan to fix this circuit issue for the next batch of lights. Not shown in the graphs, but light has a low battery warning on NiMH (i.e. light starts to “flash” as the battery is exhausted). JetBeam confirms that the light uses PWM, but the frequency is high enough that I can’t detect it with my setup, or notice it in everyday use. 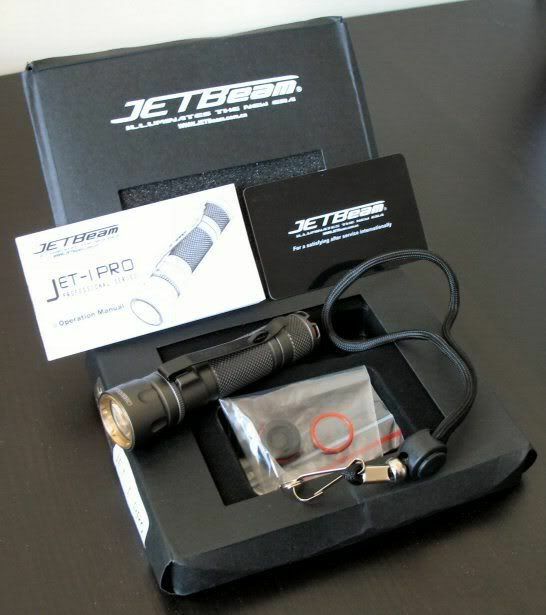 The Jet-I Pro has 2 modes, General and Advanced. The general mode allows you to select among the 3 brightness levels reported above, while advanced mode allows you to select strobe (“alarm signal”) or SOS. Unlike the earlier JB lights that had a complicated switching mechanism, changing modes is now done by half-pressing the switch 3 times within 1 second. Within each mode, just soft-press the tailcap to advance to the next output level. Light has a memory mode, whereby the current output level is memorized by the circuit if left on for 2 seconds or more (indicated by a quick blink). Sequence in General mode is Off > Lo > Med > Hi. Sequence in Advanced mode is Off > Alarm Signal > SOS. I must say, it’s a welcome change to find JetBeam making the mode switching so straight-forward. No more complicated series of modes, much simpler in comparison to their earlier lights. Build quality is top-notch, as good or better than other JetBeam lights I’ve owned (which were all quite decent). Machining is very good throughout, although the raised portions around the tailcap switch are a bit rough (i.e. like the C-LE and MkII series lights). Light features square screw threads, which should help reduce risk of cross-threading. 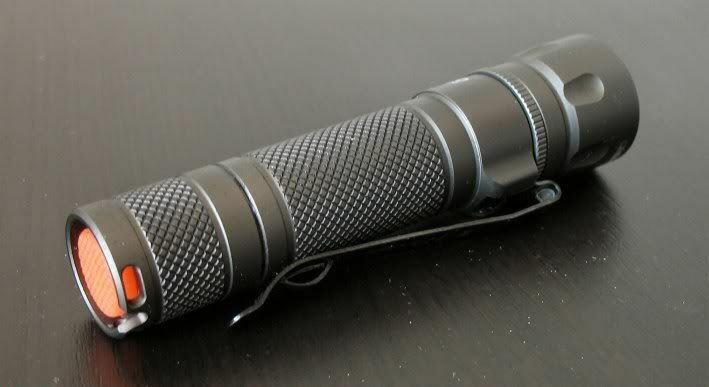 Diamond pattern knurling is slightly more aggressive than most Chinese-made lights (although still nowhere near Surefire “rip a hole in your pant’s pocket lining” type of knurling ). Brass (?) ring in the head of the light has some crenellated divits in it, and looks fairly attractive in my view. Doesn’t seem to have any actual function beyond decoration. Metal clip is removable, but you have to use a fair amount of force (and may risk scratching the anodizing). Anodizing is perfect on my sample, and is a very nice slate gray natural finish (HA-III). Lettering is very and crisp, no blemishes on my sample. Gold-plated battery springs are present on both the light engine and tailcap, so all batteries should make good contact. But the extra tension makes it so that the screwing on the tailcap is a bit “stiff” with the battery installed (common feature on all my JetBeam lights). Some protected 14500 may not fit due to extra battery length and tight fit with the springs (my AW 14500 fit ok, but are rather tight). Switch is a standard reverse clicky, slightly stiff, with a standard traverse. Switch retaining ring is made of plastic - not metal - so be careful you don't over-tighten it. Also, I've noticed part of the spring getting caught under the retaining ring a couple of times while changing batteries (needs a gentle tap to dislodge and spring back up fully straight). The tailcap threads are unfortunately NOT anodized, so tail-cap lockout is not possible. For this part of the review, I am going to compare the JB Jet-I PRO (R2) to the EDGETAC NiteCore DI (Q5), Fenix L1D (Q5), and LumaPower Dmini-D (Q2). 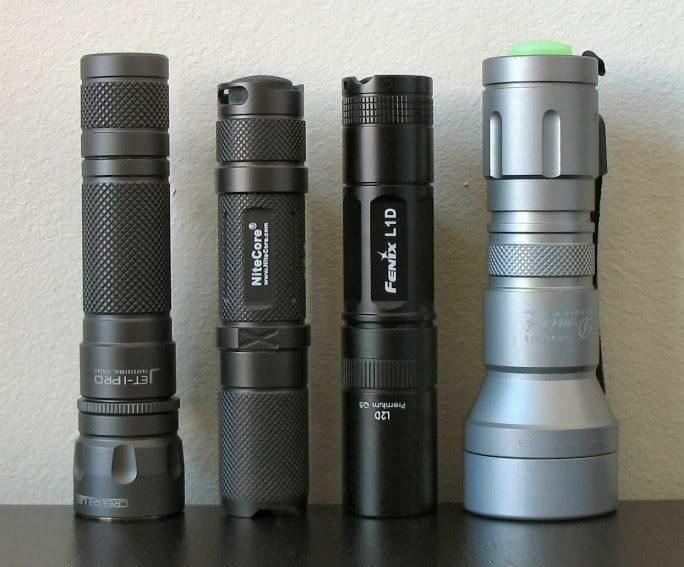 Comparison of beamshots. From left to right, JB Jet-I PRO, EDGETAC NiteCore DI, Fenix L1D, all on Hi on 2650mAh Duracell NiMH. The Jet-I PRO has a tighter hotspot than the other 1AA lights, thanks to the bigger reflector. It is also a bit “ringier” due to its smooth reflector (for maximum throw). Tint on Hi is a premium white, slightly warm (but see discussion below for low modes). As you can see, beam profile is remarkably similar to the Dmini. How well does it really throw in comparison? I’ll give you some lux @1m numbers in a minute, but I don’t think they tell the whole story. A picture is worth a thousand words ... here are some multiple-exposure beamshots of a "gremlin" at 50 feet in my basement. While not quite as bright as the Dmini-D Q2, you can see it does a much better job at 50 feet than the more general-purpose NiteCore DI does. Although the beam is fairly white on Hi (only slightly warm), there is a noticeable beam tint shift on the Med and Lo modes into the “pinkish” tones. I would estimate tint as a good WG/WH on Hi, WJ or a good WQ on Med, and definitely WQ on Low. Although I’ve seen such tint shifts before, it’s usually far more subtle on Crees. I’ve checked with JetBeam, and they suggest the “silver” versions of the Crees are more likely to show this tint shift. I think we need to wait until more samples are out into other people’s hands to draw a conclusion. The effect is not overly distracting, but it is noticeable when changing modes (especially from Med to Hi). 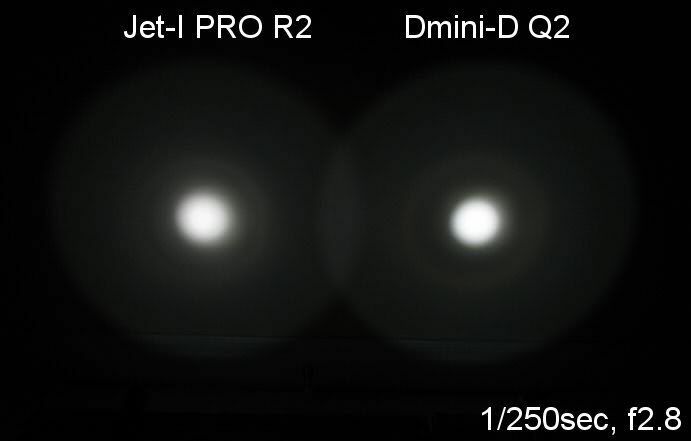 Again, I think the Dmini is really a better comparator for the Jet-I Pro than any of the other 1AA lights. So despite the fact that my milk carton lightbox shows initial overall output is the same between the Jet-I PRO and NiteCore DI, the ceiling bounce shows a slight advantage to the Jet-I PRO. Note, however, that there is no difference compared to my pre-production NiteCore DI. Maximum output on the Jet-I PRO is comparable to the NiteCore DI on all battery types. Runtimes are also comparable, except on alkaline where the Jet-I PRO underperforms somewhat. 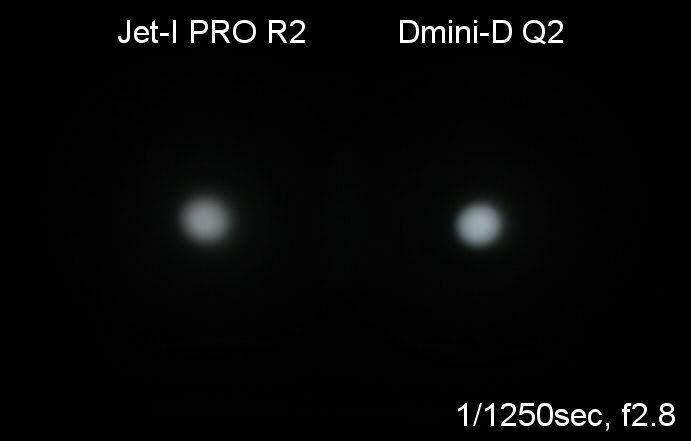 Med and Lo output levels of the Jet-I PRO are slightly higher than Fenix L1D or Dmini, but not by much. Runtime is typically inferior to the other 1AA lights, however. Regulation is very good on all rechargeable battery types. Like the NiteCore DI, it’s clear that this light was designed to excel on rechargeables (NiMH and Li-ion). Runtime on alkaline is very poor at all levels, compared to other 1AA lights (especially on Lo). 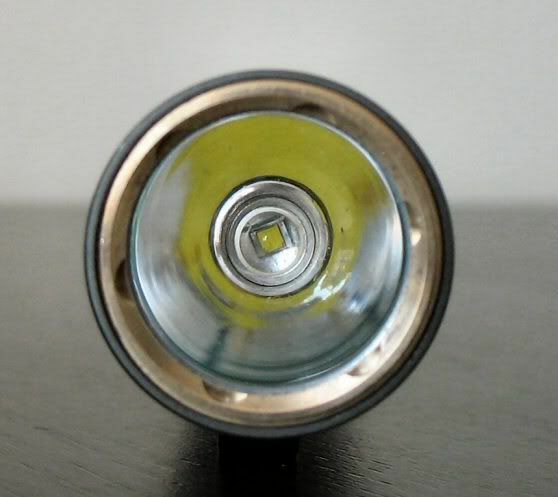 Runtime on Energizer e2 lithiums is also lower than other lights. Excellent maximum output and throw on all battery types. This is the best throwing 1AA light I have ever tested. Runtimes on Hi are excellent on rechargeable battery types, considering the output. Output and runtime on 14500 is very good, with output somewhat brighter than regular batteries (although not the brightest I’ve seen – on 14500, Fenix and JetBeam models are brighter, but shorter lasting). Efficiency on Med-Lo mode is significantly lower than the competition. Further, there’s an issue with 14500 on Med having both lower output and lower runtime than Hi - this needs to be fixed. EDIT: JetBeam has informed me that they plan to fix the Med-14500 issue for the next batch of lights. Runtimes on alkaline are very poor compared to the competition in 1AA format (especially on Lo). Similarly, there is lower runtime on Energizer e2 lithium (L91) compared to the competition. Output levels of Med-Lo should both be reduced from current levels. Tint shifting between modes is a potential issue that needs to be explored further. The user interface is vastly improved over earlier JetBeam models. Build quality on my sample is very high, best I’ve seen from JetBeam so far. Only complaint is the tailcap spring - seems to be under a lot of pressure with longer batteries (e.g. protected 14500), and I've had a few instances now of it getting pinched to one side when changing batteries (i.e. part of spring seems to get temporarily caught under the plastic switch retaining ring). No real problem so far, but I suspect this is the weakest link in the light for long-term use. A final comment: there’s been some backlash about the output levels on Med-Lo for this light, and their relatively poor efficiency. I agree efficiency definitely needs to be improved, and I personally like a lower low mode. But it’s important to note that the Jet-I Pro is designed to be a thrower, and its output levels are not that far off from the classic pocket thrower: the Dmini-D.
IMO, this light is a step in the right direction for a 1AA thrower. However, it could use a lowering of output levels in Med-Lo, and more importantly it needs an improvement in efficiency on lower modes. Oh, and a tailcap lock-out feature would be nice.